Save your fingers: open bottles with CapTwist! 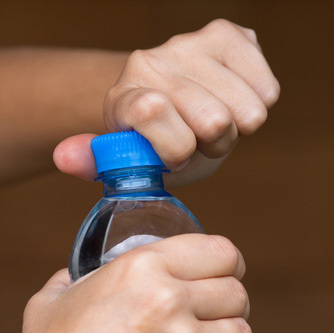 There are two sides to the CapTwist to ensure a snug fit when opening a bottle. We effectively used it on water and soda bottles, twist-off beer and wine bottles, sauce bottles, and even some nail polish bottles! Keep CapTwist in a junk drawer at home, or use the key chain hole to take it with you or to attach it to your cooler. It is small enough to fit in a purse or a backpack; yet it fits just right in your hand. Don't you just hate wrestling with bottle caps? You are thirsty and annoyed. The skin on your fingertips is sore, or maybe your joints are reminding you (again!) that you have arthritis. Truly, out of all the battles in your life, this one is insignificant but irritating. Luckily, it is easily won! With CapTwist, most stubborn bottle caps open quickly and effortlessly. Just fit the device over the bottle cap, twist, and voilà! your drink is served!